This meticulously cared for home offers 126’ of Lake Michigan shoreline and will provide you with the ultimate in a tranquil retreat, yet only minutes from Sturgeon Bay. It boasts over 2,600 sq. ft. of total finished living area, with many custom amenities. Living area includes nearly 800 sq. ft. of finished lower level, perfect as a game/recreation room. Water and woods views can be enjoyed from every room. The grounds have been caringly managed and will give you the feeling of being on a permanent vacation. 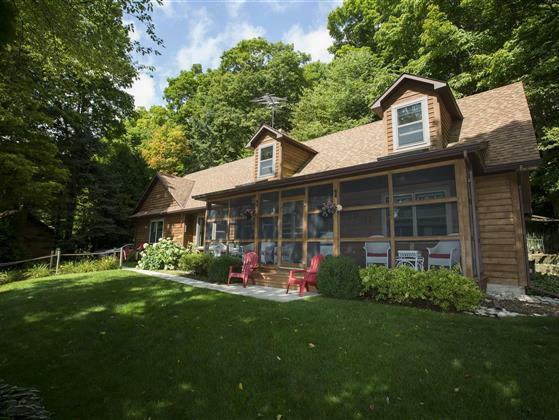 In addition to providing its Owner with an amazing Door County setting, this home has also been run as a profitable, and high demand, VRBO during the summer months. With this home, you can truly have the “sun in the morning and the moon at night".